The only good thing to emerge in this week’s peace and justice news is President Obama’s choice of Harvard law professor Elizabeth Warren as his special advisor on consumer affairs. In a refreshing back of the hand slap to the banking lobbies, Obama asked Warren to organize and run the Consumer Financial Protection Bureau, the agency Congress created to keep banks from gouging consumers and wrecking our economic system. In a post on her own blog, Warren pointedly stated she would start work “right now”, her way of saying she and the president agreed that it was both smart politics and good governance to avoid a long, drawn-out Senate confirmation process. This is good news because the bankers’ favorite senator, retiring Democratic Senator Chris Dodd, of Connecticut, said the bankers didn’t want her. He should know. Besides, anyone the big banks don’t like has to be on the side of the consumer. As far as good news goes, however, that’s about it for now. On the bad news front, it took a call from Secretary of Defense Bob Gates to put the fear of God into a shirt tail preacher from Florida, who was ready to carry out a Koran-burning stunt. Jim Wallis of Sojourner‘s fame, writes in the Washington Post, (“Jim Wallis on the story behind Pastor Terry Jones’s change of heart“), that the pastor was influenced by Wallis and a few of his evangelical colleagues to stand down from the burning. That could be, though on balance, I suspect Secretary Gates got the pastor’s patriotic attention faster than did his religious colleagues. Whatever combination of events it took, that nasty storm has subsided. The burning escapade, of course, should never have gotten past a few lines in a local Gainesville newspaper. It became a Big Story only because the ugly anti-Islam hate fire storm now sweeping the land, is fueled by political figures like Newt Gingrich, and inflated media coverage that stirs folks like Jones into foolish and dangerous actions. The week’s worst news, however, is yet another “doomed to fail” set of “peace talks” between Israel and the Palestinians. Secretary of State Hillary Clinton, whose husband was the best American president Israel ever had, until he lost that title to George W. Bush, is presiding over this latest round of peace talks. 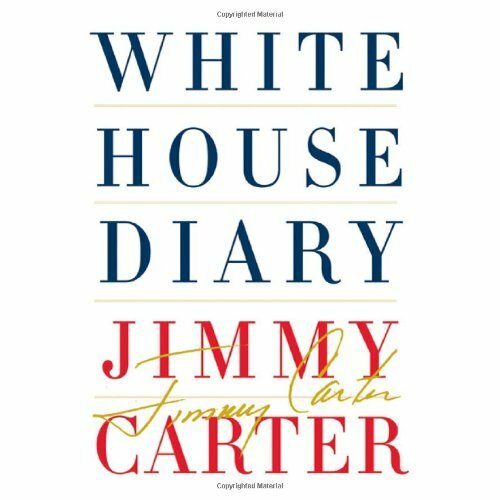 President Jimmy Carter’s book, White House Diary, out this week, is harshly critical of former President Clinton’s settlement policies. The Associated Press has access to an advance copy in which Carter points out that settlement building was “especially rapid” during Clinton’s 1992-2000 administration, settlements that continue to expand during these current negotiations under Bibi Netanyahu, with President Obama’s lobby-driven acquiescence. Clinton and his blatantly pro-Israeli staff learned to play the game of hypocrisy, knowing that the American public had been manipulated over the years by a Zionist Lobby that worked through the Congress and a compliant media to sell the Israeli narrative. Hypocrisy is the practice of deceit, pretending one thing to cover up an actual reality. Ha’aretz columnist Amira Haas reaches back in her journalist memory to offer a rationale behind Israel’s self-deception that has eroded its moral base by living a lie since 1948. Her description is a clear picture of how hypocrisy in statecraft works. In the late 1970s or early 1980s, [Israeli] Professor Asa Kasher spoke at a conference of some kind about the differences between Labor Party governments and Likud governments. The Labor governments were hypocritical, and there is something positive about hypocrisy, Kasher said. At least the hypocrite knows there is a binding system of values, and that he is not acting according to them. As a result, he disguises his actions. It was understood from Kasher’s comments that Labor governments knew that ruling over another people against that people’s will was an impermissible act. The Likud, Kasher said at the time, as memory permits to reconstruct after the passage of 30 years, doesn’t feel at all bound by those values. The impermissible had become legitimate. By that measure, Prime Minister Benjamin Netanyahu has become a Laborite who is playing the hypocrites’ game, whereas Foreign Minister Avigdor Lieberman is the 2010 version of a Likudnik, by Kasher’s definition. Lieberman is someone who tells it straight while his prime minister blurs and obscures to make it easy for the American allies to feign progress while we mark time in the realm of deja vu. Lieberman the non-hypocrite knows what he’s talking about when he says no peace agreement will be signed, even in another generation. A peace agreement is not a business contract. It requires a change of values of a kind that does not exist within the vocabulary of the democratic Jewish state, which elevates the system of double standards to a level of virtuosity. We will have refused to allow the Palestinian people to choose their own leaders, forcing them instead to accept leaders that have been approved by the US and Israel. We will have assassinated or jailed or isolated legitimate leaders while we wait for “partners for peace” by which we, and Israel, always have meant, “partners” who do our bidding. We will have learned to embrace the same brand of hate-spewing lying venom that Israel has employed to demonize Palestinians, Arabs, Muslims, in short, the “others” who have dared to demand justice when there has been no justice except for the brand that is “made in Washington and Tel Aviv”. That alien brand no longer resembles our values. We have allowed the impermissible to become legitimate. A New York City Muslim prayer center in a high rise building, has entered our political discourse as a “training ground for Muslim terrorists”. Our politicians deceive the masses in order to disdain those who cry for justice. The elections of 2010 and 2012 will show us if we have totally abandoned our values and our belief in justice. 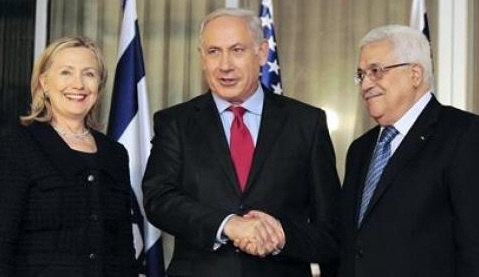 The picture at top of Hillary Clinton, Bibi Netanyahu and Mahmoud Abbas is from Reuters Yin Dongxun/Pool. Jim, I also agree that Warren is good news. Hopefully she will be able to make the changes that will substanially aid the millions without medical insurance, homes and something to hope for. I have ben convinced that the charade in the peace talks has done more than anything else to destroy our values. We cannot continue to tell lies and keep our values sacronsanct. Our values are being destroyed on the shoals of deceit. Strong words which are so true.